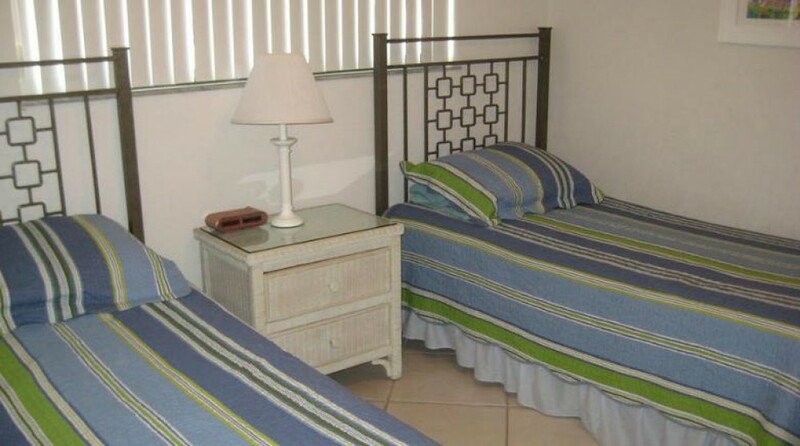 The wonderful condominium is located on the white sandy beach!! The Master bedroom offers a king size bed, walk in closet, private bath, color tv with cable, along with DVD player & remote, private entrance to porch. The screened lanai looks over the beach & beautiful water. This is a great place to watch the dolphins & manatees!! The other bedroom offers 2 twin size beds, private bath & closets. Living room area features yellow colored leather sofa, swivel chair, and a leather recliner with sliding doors to screened lanai. There is a LCD TV with DVD/VCR & remote. The kitchen has all amenities & appliances you will need. All bed and bath linens are supplied. Just bring your family/friends, bathing suit and groceries!!! $ $85.00 cleaning fee ALL RATES ARE BASED ON THE NUMBER OF ADULTS/CHILDREN AND THE SPECIFIC WEEK(S) RENTED. ALL RATES ARE SUBJECT TO CHANGE WITHOUT NOTICE.